It's annoying to be "always on". At least, in that annoying way we think of when we think of people who are "always on". On the other hand, there's a more subtle way to be "always on". With the proper care and feeding, an attitude can be developed that allows the world to be your stage without driving other people crazy. At least, that's the theory I'm working on. It's not about working on developing an act in a vacuum in the wee hours of the morning, in front of a mirror, in the bathroom, or while driving on the freeway. There's a certain way of thinking, feeling, breathing, wandering... sustaining an amused point-of-view... that will just naturally improve those brief moments under the spotlight. So, let's see if I can prove this theory. Think "Zen and the Art of Motorcycle Maintenance". The vehicle I'm working on is myself. Once again, it's nothing new. Just a friendly reminder. If you want to be funnier on stage, don't work so hard by yourself on the freeway. Work on not working so hard at it throughout the day. Be aware. Be friendly. Be amused. And above all, just "be". As much as I try convincing myself that I'm "worthy" of success, deep down inside, I still don't believe it. In a way, that's a good sign. It means my ego isn't totally out-of-check. It means I have a somewhat healthy view of myself as an average Joe. But it also means that I'm still clipping my own wings. The ceiling has been built by me. It's the same pattern over and over again. Make the team, and sit on the bench. Learn to draw, then put away the art supplies. Become a decent musician, and hide in the corner of a deserted coffeehouse. I feel like I'm on the verge of something. Like something's going to pop. But contrary to popular belief, the popping isn't going to happen "out there" somewhere. It has to happen "in here" (he wrote, mentally pointing inside of himself). My guess is that I might lose a lifelong belief that I don't "belong" in the places where I want to be. Aside from that, I can't think of anything else. I read my e-mail today, and saw a message from yesterday, asking me if I wanted to perform tomorrow. It was from Kristian Vallee. He books the "Hot Shots" shows on Tuesdays/Wednesdays at the Irvine/Brea Improvs. To make a long story short, I got a spot. Six minutes. About 125 paying customers. Good times, and good preparation for re-entering the ionosphere (what?) at the Hollywood Improv next Tuesday. This blog is about stand-up comedy. So why is the title of this blog entry about USC kicking the crap out of Oklahoma tonight? Because that's all I can think of, that's why. And because I went to USC, that's why. 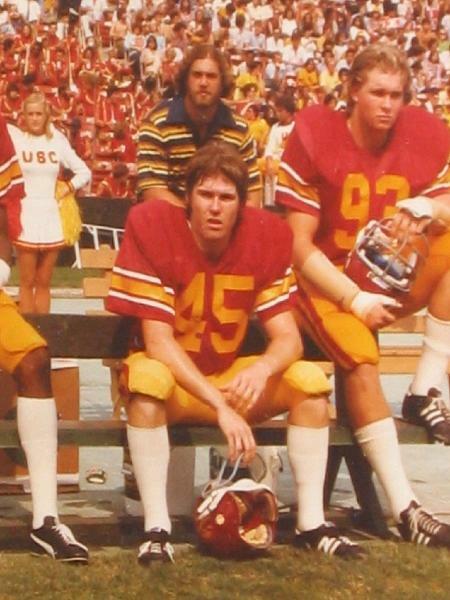 And because I was a linebacker at USC, that's why. Somehow, I need to tap into this energy more often. USC won tonight for a number of reasons. Some known. Some unknown. One thing I want to take away from the post-game analysis is how much fun Pete Carroll has brought to USC. I think that's one of the reasons USC outplayed OU tonight. They were loose. They just gripped it and ripped it. They let their talent fly. Fun, baby. Have fun. It's a constant reminder for football, comedy, and life in general. Next Tuesday, I'm going to act like Coach Carroll and his team when I go up to Hollywood. It won't be the first time I do that. Just another reminder. And it's what it's going to take to compete and win up there. I'm coming off of the bench, baby.